The utilization of eolian sands as construction fine aggregates in bricks and mortar production has been achieved on dune sands collected from Jeddah-Al-Lith area (Saudi Arabia). These dune sands had been mixed with well-graded crushed fine aggregates at a variety mixing ratio fluctuated between 10 and 100% of the total volume of sand at constant ratio 1:2:3 (cement/water/sand). By comparing the physical characteristics (grain size, specific gravity, texture) mineral composition, workability and compressive strength features of the study materials, it is found that similarity with the most of the dune sands characteristics which reported in pervious literatures. The obtained results show that except for the gradational and textural features, these materials are fitting as construction fine aggregates when the mixing ratio not exceed than 50% of the total quantity of sands. Up to 50%, the compressive strength will be abruptly decreased owing to internal failure as a result of bleeding and segregation of raw mixtures before consolidation processes that due to increasing of surface area of well-rounded and high sphericity of dune grains. 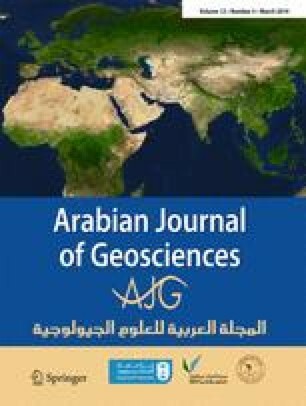 The authors wish to acknowledge Professor Abdullah M. Al-Amri (Editor-in-Chief) and Professor Nabil Khélifi (Journal Managing Editor, Springer) and the two reviewers (Professor Ali Mesaed and Dr. Bader Hakami) for their insightful comments and criticism that improved the original manuscript. This project was funded by the Deanship of Scientific Research (DSR), King Abdulaziz University, Jeddah, under grant no. G-2-145-1438. The authors, therefore, acknowledge and thank the Deanship of Scientific Research (DSR) for the technical and financial support they kindly provided.